For Such As These: What's He Thinking? "told me this was mom and hug you and you were talking and I was thinking what you sayin, I don't know english and I was lookin for someone to tell me what you were sayin"
Crack me up! I just laughed and laughed over that! Poor kid! And I was just a rambling! I wondered what was going through his mind...now I know! that language barrier must be so hard for the little ones-of course, i think it is hard for the big ones, too! too funny that that is what he was thinking :)!! Too sweet! Good to know he wasn't thinking, "You mean this crazy white lady is going to be my mom!". The picture is adorable! Your smiles warm my heart! It's wonderful that your son can remember what he was thinking and is able to communicate that to you today! 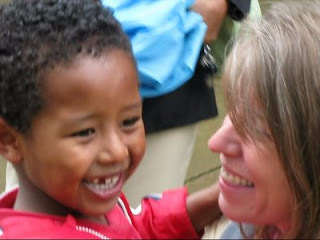 Formula Desperately Needed In Ethiopia!